and won’t be official until the 2011 Boy Scout Requirements book is released in January 2011. 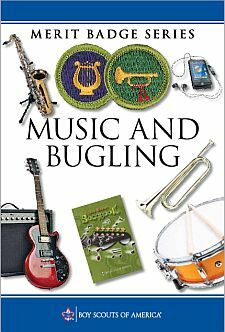 Scouts may continue to earn the Bugling and/or Music merit badges using the old pamphlet until that time. or if they start the badge before January 1, 2011, they may earn Music merit badge using the previous requirements, shown below. Attend a live performance, or listen to three hours of recordings from any two of the following musical styles: blues, jazz, classical, country, bluegrass, ethnic, gospel, musical theater, opera. Describe the sound of the music and the instruments used. Identify the composers or songwriters, the performers, and the titles of the pieces you heard. If it was a live performance, describe the setting and the reaction of the audience. Discuss your thoughts about the music. Interview your parents and grandparents about music. Find out what the most popular music was when they were your age. Find out what their favorite music is now, and listen to three of their favorite tunes with them. How do their favorites sound to you? Had you ever heard any of them? Play three of your favorite songs for them, and explain to them why you like these songs. Ask them what they think of your favorite music. Serve for six months as a member of a school band, choir, or other local musical group; or perform as a soloist in public six times. List five people who are important in the history of American music and explain to your counselor why they continue to be influential. Include at least one composer, one performer, one innovator, and one person born more than 100 years ago. Teach three songs to a group of people. Lead them in singing the songs, using proper hand motions. Make a traditional instrument and learn to play it.